A broad range of peripherals, developed specifically for front-office automation in banks and post offices, delivering a complete, flexible service: from printing of passbooks, forms, receipts and payment slips, to deposits and withdrawals, check endorsement, through to the most advanced forms of digital imaging. 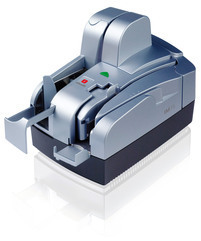 The MB-2 ADF is the latest model to join Olivetti’s PR2 Plus family (the world’s most popular bank counter printer range) and combines a printer, scanner and cheque reader in one compact device. The ADF is capable of handling ID cards, multiple sheets, passbooks and passports and can also process cheques and enable bill payments. 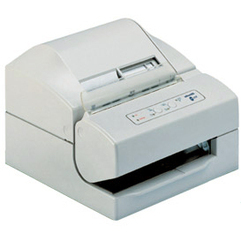 Documents and cheques are inserted at the front, of the machine, and output at the top, which not only allows simple and quick access but also saves space. 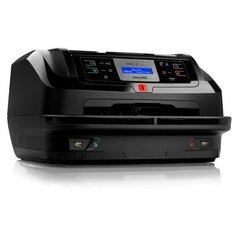 With its versatility to manage a wide range of documents, and the capability of reading OCR, barcodes and MICR, the MB-2 ADF represents one of the most versatile and complete multifunctional counter printer/scanners currently available on the market. 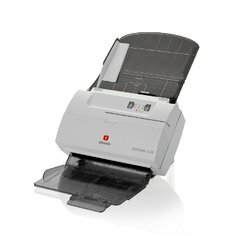 Olivetti PR2 PLUS has been designed in different models from the entry-level version to the dual-side scanner model (MB-2model) in order to satisfy multifunctional front-office applications. It is capable to print on all Bank forms from single-sheet and multiple-copy documents to passbooks. 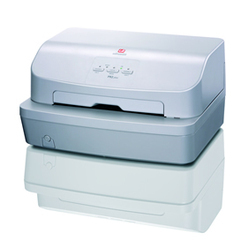 The Olivetti passbook printers PR2 PLUS offer complete solutions in bank teller. A single station impact dot matrix printer. With its high throughput (230/315 cps), attractive design, compact dimensions and silent printing the PR4 SL guarantees the reliability of continuous operation. 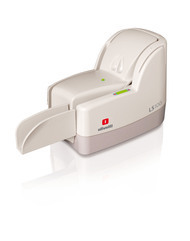 Ideal for filling in documents, the PR4 SL is an invaluable tool for counter operations. 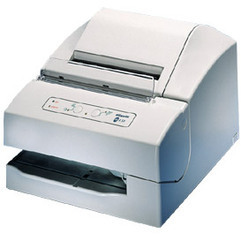 Documents may be inserted from the front or the top of the printer. 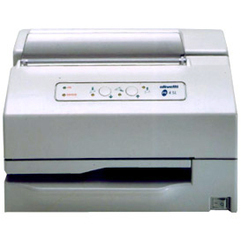 The PR4 SR is a two station dot matrix printer, intended for applications where the journal is not requested, which can handle individual forms (slips) and a single paper roll. The first station prints either receipts or the journal (a duplicate copy roll must be used if both types of document are required); the second station prints transaction slips, inserted either from the top or the front. 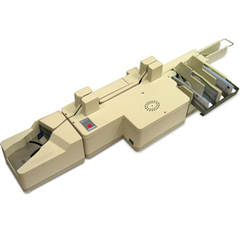 A three-station dot matrix printer, for individual forms and two paper rolls (maximum width 70mm). The first station, with an automatic tear bar, is used to print receipts, the second station prints the journal and the third station prints transaction slips, inserted from the top or the front. The PR4DR offers advanced capabilities, outstanding productivity in printing and paper management, low noise level and high operating speed that makes it a top performer in its market class. 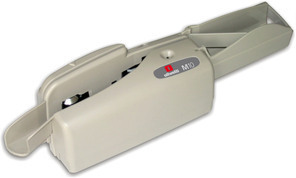 M10 is the professional entry level check reader for the banking teller, ideal for a fast and reliable reading of MICR encoded banking and finance documents. It comes with USB which is used both for data communication and to supply electrical power, saving space otherwise used by external power supply. M10 friendly design and automatic drop and feed mechanism (pinch roller) make it very simple and straightforward to use. 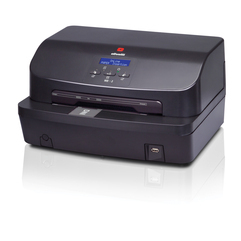 IM75 is the perfect scanner for advanced bank front-office operations. It reads MICR and OCR codelines, provides double-side image capture, in colour or greyscales, and offers a function for conversion into black/white. IM75 has been designed to handle financial documents (cheques, utility bills, postal slips, etc.) at high speed, with absolute security and reliability, and minimum noise levels. The device features a large-capacity input tray and an output tray. It is equipped with double-feed and full-bin sensors, to facilitate operation with one hand. 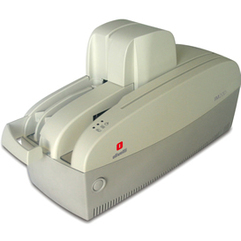 IM200M is a high-end scanner for bank back offices, designed to handle large volumes and a wide variety of cheques and documents. Key features include single or double-face scanning, in colour or greyscales, an MICR, OCR and barcode reader using SW libraries, a printer to endorse the back of the document and a double-feed sensor.